The Iraqi IRAM was purpose-built for one thing: popping over T-walls and Hesco barriers at short ranges that prevented interception by C-RAM and creating mass casualties on-target. 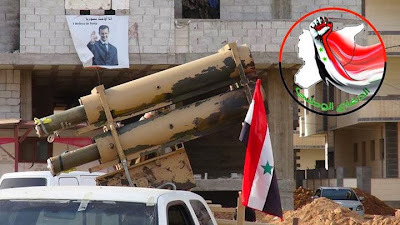 Obviously, in Syria, there was no need for either side to use the munition for this purpose, and there were some who doubted the Syrian government would used improvised weapons, especially inaccurate and powerful weapons in urban areas. 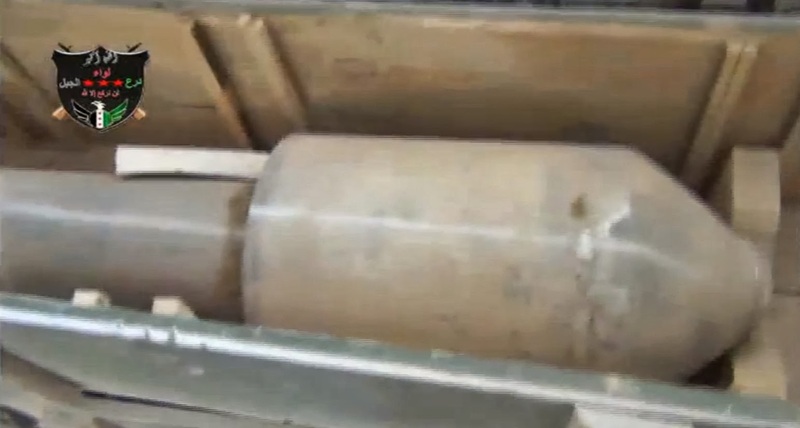 In the following months I continued to collect videos of IRAMs (see here), with the unexploded remains of the munitions showing up in Damascus, Aleppo, Homs, and elsewhere. While it was claimed by opposition members that these munitions were fired by government forces, it wasn't until recently that an increasing body of evidence began to appear showing definite proof that the IRAMs were being used by Syrian government forces. 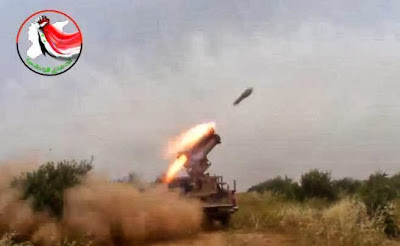 The video shows an IRAM being loaded and fired from a single barrel launcher, and was the first video showing the Syrian military using IRAMs. The enemy was applying a scorched earth policy by firing Iranian vacuum bombs, which caused whole building to fall down. This was forcing the fighters to retreat to another building. This weapon was used by Hezbollah forces in Qusayr. He described them as 107mm rockets fitted to something with a higher payload, with the 107mm propelling everything. He said the max range on these was about 1 km, but most of the time they were simply fired across the street horizontally at extremely close range. By his description, one of these could do significant damage to a small house. He said that these rockets really helped Hezbollah shift the tide in parts of that front-line. 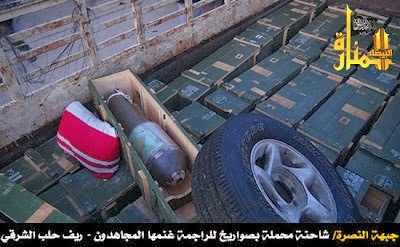 At the time there was no more evidence of these munitions being used in Qusayr, and no way to confirm the story of the opposition fighters about how they were used. The launch footage is then followed by footage showing the IRAMs hitting multiple targets. 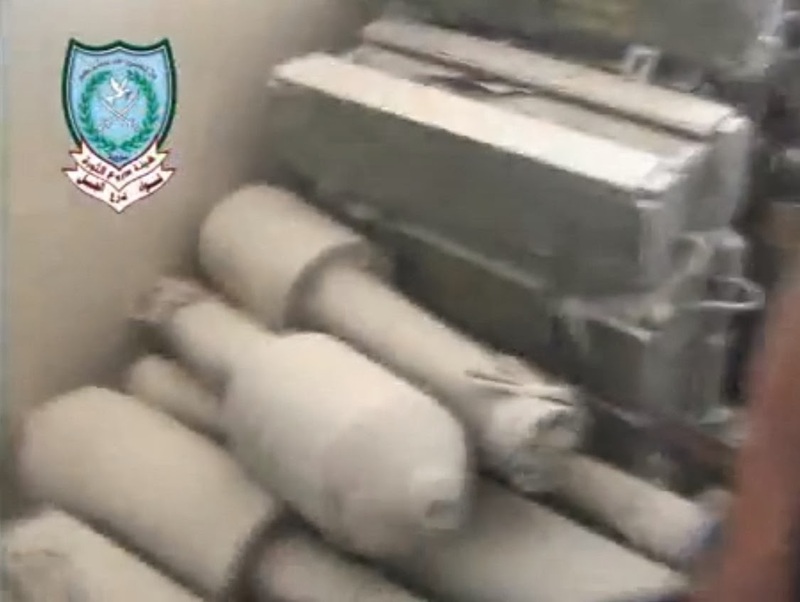 It appears, as described by the opposition fighters in Qusayr, that these munitions are being used for devastating effect against occupied buildings only hundreds of feet away from the launch site. It's not hard to imagine how devastating these munitions are, and difficult how (if not impossible) these munitions would be to defend against in an urban combat situation. These aren't the only powerful explosive weapons the NDF has been provided with, with videos showing them using the launchers linked to the August 21st attack being posted online recently (albeit using the explosive type of munition), and the use of IRAMs in urban combat would seem to give them a significant advantage over opposition forces. This goes some way to explain some of the more unusual reports from the opposition of the weapons used against them, and it seems these weapons will continue to be a popular choice for government forces. These are close quarters siege weapons best for use across the street, not across the city. With the single tube direct fire launcher, as a former infantryman I'd give my eye-teeth for this amount of firepower in such a small bundle and not having to rely on battalion, Brigade, or Divisional arty support. In the indirect fire mode they will be similar to mortars but with a lot less range. The SAA has a winner here. 1. IRAM, 107mm rocket motor propelled, warhead; Rocket Motor=Mil-Spec construction , state manufactured 107mm rocket motor. Warhead and Rocket Motor to warhead adapter=Not Mil-Spec construction/manufactured locally. 2. UMLACA Small (IRAM); Rocket Motor=Mil-Spec construction, state manufactured 122mm rocket motor or close variant. Warhead and Rocket Motor to warhead adapter=Not Mil-Spec construction/manufactured locally. 3. UMLACA Large (IRAM); Rocket Motor=Most likely - Mil-Spec construction, state manufactured 220mm or 240mm or close variant. Warhead and Rocket Motor to warhead adapter=Not Mil-Spec construction/manufactured locally. Note; Thin skinned, large warheads contain much larger Net Explosive Weight (NEW), per warhead, then the typical thick skinned warhead and are very devastating in an urban environment. Example; HEP/HESH/SQUASH warheads were primarily developed for there, armor defeating, spalling effect. Later it was discovered that these same thin skinned high NEW warheads were extremely devastating in close range, direct fire applications, in urban type target rich settings. 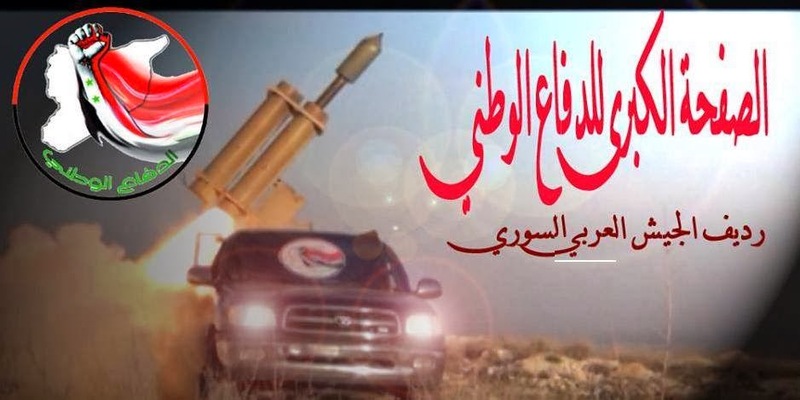 Ahrar Al-Sham (Takfiris) are using their own version of oversized warhead rockets. Re Ahrar al Sham IRAM. Their version of IRAM has a CEP identical to its range. Their target is town sized. They have no military value other than terror. In comparison the Hezbollah IRAM and the Syrian Eskimo-107 are militarily useful weapons that can be fired at particular targets e.g. a specific building. what is purpose of ESKIMO-107???? You can find one IRAM (the 4 barrel) at 1:47, but there could be more. There really isn't a need to call out any 107, 122 or 220mm rocket motor as 'Mil-spec' (groan), 'military', state-produced, mass-produced or manufactured because THEY ALL ARE. Nobody makes rocket motors in their garage that are *the least bit* relevant here. Just sayin'. The 107's in Syria are nearly always Iranian(*) or Chinese. The only marginally interesting detail would be if they were NOT. Nearly everyone in the Middle East has them. Elaborate 'launching systems' are optional for either the original warhead or IRAM version. A rock or piece of pipe work equally well and have nearly the same accuracy. (*) Tinfoil-hat factoid: English printing on Iranian 107 is most likely fake. An unnamed ME country is known to regularly do this in order to demonize Iran to the west. Iran hasn't exported rockets to english-speaking countries in... well, never. "...The Iraqi IRAM was purpose-built for one thing: popping over T-walls and Hesco barriers at short ranges that prevented interception by C-RAM and creating mass casualties on-target..."
No doubt they are frequently used for that purpose in Iraq and Afghanistan, but they have been around a lot longer than the west's C-RAMs. I would suggest they are purpose-built for a slightly different reason: they're the easiest and cheapest way for Hezbollah (or anyone else in the ME) to lob 100 lbs. of C-4 out half-a-kilometer or so vs. the few pound payload in the normal 107mm rocket. Quote " Nobody makes rocket motors in their garage that are *the least bit* relevant here. Just sayin". Paveway Mk IV; First let me say thank you and next where have you been the last two months, I could of used some help in convincing folks of exactly what you stated. I am glad that finally, someone is starting get it. Anything I know about the tools of death used in the Middle East come from the most heavily censored and sanitized war in U.S. history: the Iraq war. If you're a U.S. citizen and post too many uncomfortable facts about *that* atrocity, then they'll eventually find your body in a dumpster in some New Jersey landfill. It's an infantry weapon and only part-time artillery so it doesn't equate to heavy mortars or howitzers or MRLS - which are artillery weapons. It works at infantry fighting distances typically up to 500m but often closer. Think of it as the heavy missile equivalent of a recoilless rifle but that has been designed for attacking structures. perhaps think of it as a mine on a rocket? Instead of sending an engineer in with an explosive mine to blow up a building you fire the explosive mine at the building with a short-range rocket. If you scroll down till you see one of the "Flying Dustbin" munitions, you'll see how that connects with these rocket munitions! The Petard mortar/gun was actually a spigot gun, which concept was used on everything from the PIAT projector at the small end, up to the LIMBO depth charge gun at the other. "...I do not understand what effect you want to achieve with this weapon..."
Most of the thermobaric warheads used today are to kill people inside fortified structures. They use an intentionally extended blast wave that will easily penetrate into building openings and travel a greater distance through rooms, hallways and other passages. Damage caused to the structure is coincidental - they're not trying to blast through a concrete wall to get to the person on the other side. Fragmentation effects are also secondary. The overpressure from the blast is the primary lethal effect. For a relatively small thermobaric warhead (small-caliber mortar, shoulder-fired rocket), the blast effect is limited to enemy in a room or behind a relatively low obstacle. For larger warheads - like the 350mm 55L cans - a target would be more like the side of a multi-story structure. You could get a blast wave of several atmospheres beyond a couple hundred meters in the open. That blast wave would also be lethal to anyone in a windowed room on that side of a six-story building, including many of those further inside the building, in the basement or on the roof. If you wanted to do the same thing using an RPG, you would have to fire one through every facing window at the same time - maybe 50 for a six-story building. Even then, many people in the interior rooms, around a corner or in hallways might survive. "...because apart from the psychological effect on civilians..."
Not the intent - large thermobarics are intended to kill everyone inside a fortified structure, not to scare people. If the SAA is being sniped from a bombed-out building in a ruined part of the city, they probably don't think there are any civilians there. "...one mortar mines of 120 mm is much more efficient and destructive in my opinion..."
If you want to demolish the entire building floor by floor to clear it of people. I think they tried that the last year or so by the looks of many of those buildings. It's impractical to clear that much building (which may only have a few snipers and RPGs) by lobbing 120mm shells through the roof all day. Any MRLS would also do the job, but you would be doing almost the same thing from the side. Blasting the building to bits to make sure no enemy are still inside. You can't do that if you have 150 buildings to clear in a single neighborhood. Thermobaric weapons are the ideal weapons for this exact kind of conflict: well-concealed insurgents scattered among a lot of bombed-out multi-story concrete structures controlling the area by denial through their snipers. Attacking key structures with thermobarics lets you put your ground troops in the building to clear it relatively quickly. I would argue that the SAA wouldn't waste cannister-payload rockets on CW agents because they're just not effective for urban warfare - the negatives outweigh any tactical benefits. You would be far better off using the rockets to deliver FAE/thermobaric payloads which *do* serve a purpose that existing weapons (large-caliber mortars, artillery or rockets) do not provide. There are thermobaric versions of those, but they are relatively rare and not known to be part of Assad's arsenal. A more modern version of the Bangalore Torpedo is the MK8 explosive hose and the M58 MICLIC. These two system are still being used today. Never heard of Tromblon mines - interesting. First page that came back was a Serb site! 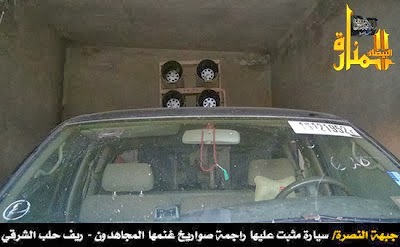 "vacuum bombs" in Arabic refers to thermobaric bombs. And your transliteration of Arabic names is abominable indicating little or not knowledge of the area or culture. In any case, whether we have IRAMs or not, the important thing is killing the rats you Brits are helping to send over. But don't worry, they'll be coming back to your White Cliffs of Dover and you'll become something like brown bread. Long live Dr. Bashar Al-Assad and death to morons like you. The Syrian opposition has a long track record of using incorrect language to describe munitions ("barrel bombs" is an alternative example), and I've seen multiple examples of various high explosive weaponry being described as "vacuum bombs", not just ODABs. Lob bombs are not new, at least 45 years old or probably a lot older. The VC lobbed one at our company CP in 1968 on Go Noi Island. I still distinctly remember the taste of the dirt that I kissed when I hugged the ground that night. As I recall they also used them at several other places, Hill 55 for one. I forget where else. In WW1, a "two inch trench mortar" actually lobbed a football-sized globe of explosive on the end of a two inch diameter stick that went into the mortar. Range was a couple of hundred yards at most. The propellent was ignited by a .303" blank, there were one ounce cordite propellent increments, with a black powder booster to make sure these ignited consistently. The firing mechanism literally was the action of a .303" SMLE No3, attached to 2" mortar tube. Which is a remarkably similar concept from the 1990s. The only real difference is that the 5.56 mm blank ignites a small rocket. Against a concrete structure, what makes the biggest effect is the amount of surface area the explosive has in contact with the structure, to couple a shockwave into it. So I think that these huge munitions will do the target structure about as much harm as the 290mm Petard rounds of WW2 (flying dustbins) but they will do very much more damage to surrounding structures and people by blast. The Petard round amounted really to the tip of one of these monsters, and that's the only bit of them that actually couples energy into the structure that is directly struck.